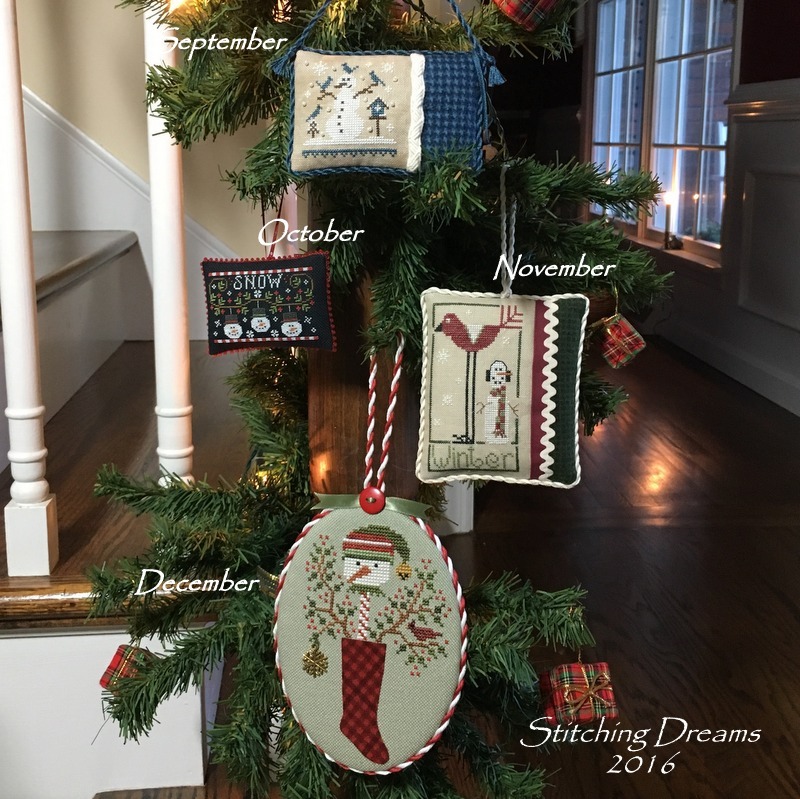 Stitching Dreams: 2016 Parade Of Ornaments! Happy First Day of Winter, my stitching friends! As we inch ever closer to Christmas morning (is it really happening in just four days?! ), I couldn't let this week go by without my annual Parade of Ornaments... This is the seventh year of doing my "Ornament a Month" stitching and I like to do one post at the end of each year devoted to the twelve little "newbies" on my tree. If any of you are new readers and would enjoy looking at past years, simply click on the year and you'll find my finishes from 2010-2015: 2010, 2011, 2012, 2013, 2014, 2015. I like to display my ornaments from the current year on a garland on my front stair bannister. It's hard to get a decent picture as it is in a hallway with limited natural light, but I promise to give you close-ups at the end. So, are you ready? Cue the music and let the 2016 parade begin... Look at all of those chubby grinning snowmen marching down the stairs! How can you resist smiling back at them? It was a fun year (and I sure used up a lot of DMC white thread!!). You can see my cherry colored dining room in the background--love it at this time of year! But, it is awfully dark due to the covered front porch just outside so I'm thinking of painting it a different color. As usual, though, I'll probably be "thinking" about it for the next ten years before I actually do anything! The Drawn Thread "The Joys Of Christmas"
Prairie Schooler Book No. 202 "Evergreen"
Prairie Schooler Book No. 157 "Holly Days"
The Little Stitcher "Blue Snowman"
Country Cottage Needleworks "Snowmen Trio"
All Through the Night "Stockingful"
So, what do you think--did any one of the chubby white fellows just call out to you, "Pick me! Pick me!"? Like any mother, I shouldn't play favorites, but I would say the two tiny Country Cottage Needlework pieces (June and October) are mine. The sheer tininess of them--stitched over one--is so sweet. I do love the December finish, too, as it is a bit different. It is awfully large for one of my ornaments, though, but it will still look nice hanging on the lower branches (or even on a cupboard knob or door handle). A tree filled with lots of love and tiny little x's! You might like to see a few close-ups--inch after inch of stitchy Christmas joy! Not much room left for future ornaments, is there? At this stage in our lives, we won't be getting a larger tree, though, so I'll just have to get creative. Eventually, when we truly downsize, I have visions of my sons and their future wives (hopefully!) sitting in a circle and taking turns selecting ornaments to take home to adorn their trees. My middle son already told me he wants all of the bird-themed ones--ha ha!! 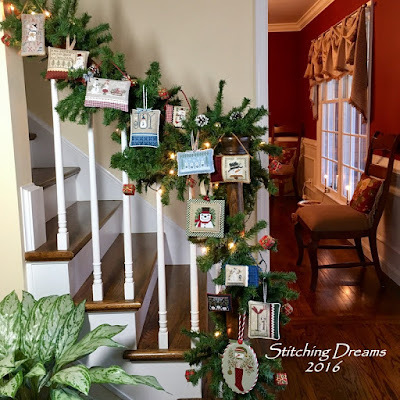 Jennifer from "Quilting Mom's Blog"
Snowmen are at the top of my Christmas decorating favorites, so I think all of this year's ornaments are wonderful. I did, however, surprise myself by having a favorite, and that extra special one (to me) is September's Blue Snowman. I love him! Thanks for sharing all your beautiful finished. 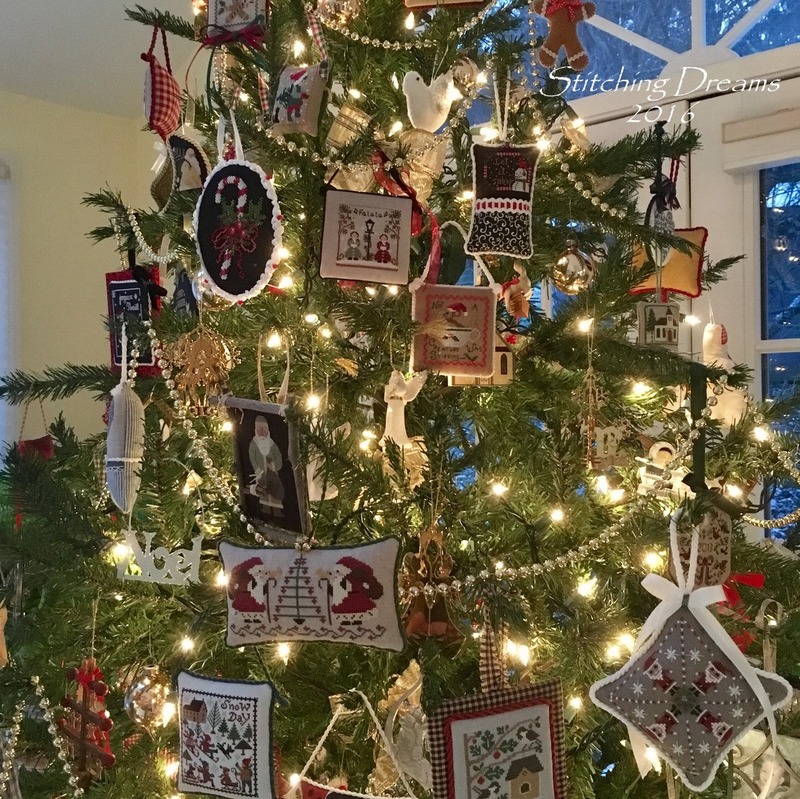 Your ornaments and your tree are absolutely gorgeous, Carol! I couldn't possibly pick a favourite snowman because they are all adorable. So nice to read that one of your son's would like all your bird pieces. I can only hope that someone will cherish mine enough to want them when the time comes. Merry Christmas to you and your family. Your tree is lovely! And what a clever idea to showcase this year's new ornies on the stairway garland. Yes, three of your snowmen are calling to me, and now I'm gonna go look at your past years new ornaments posts. What an inspiration!!! I love them all! And, I've already gone searching for the Casa Mia freebie. Thank you for that tip and for sharing your beautiful banister and tree! Merriest of Christmases to you, Carol! You do such an excellent job of decorating that tree. 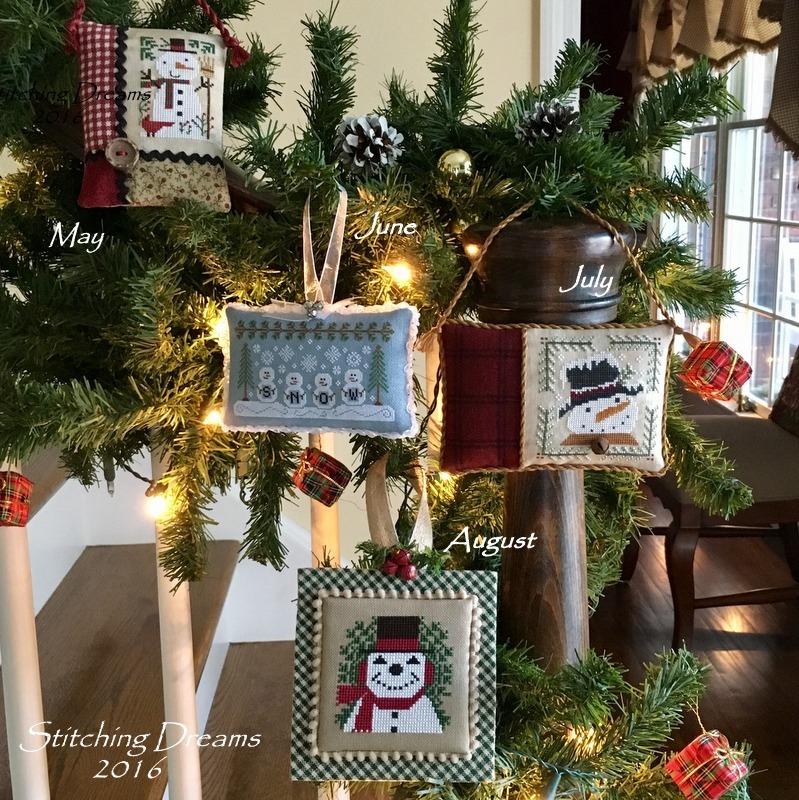 We all know your stitching and finishing are superb, including the fun year of snowmen. But I love how artfully you hang them and include the other trimming as well. Frankly, a lot of photos of trees covered with ornaments don't do justice to the tree or the ornaments. Your special touches enhance both! Better get those sons to start putting their favorites into lay-away before the best are reserved! Your Christmas tree is stunning Carol. Love all your snowmen ornaments this year. Merry Christmas. Your tree is so beautiful! You've inspired me to stitch and finish more ornaments, and hopefully have a tree of my own some day. Probably much smaller though! Merry Christmas! So very beautiful Carol! I look forward to tis post every year! Carol, I enjoyed this year's Parade of Ornaments. I love snowmen/women and yours make me smile. It is hard to pick one of the twelve, so I pick all of them. I look forward to hearing what your theme for 2017 will be. I like your new tree topper. Where did you find it? Merry Christmas to you and yours! You 2016 result is amazing! Ohhh Carol, que bonitos todos, como me gustan, y que bien lucen en esa espléndida escalera. Mis preferidos Diciembre y Marzo. Marzo ya lo he acabado en 1 x 1 pronto lo enseñaré. Muy felices fiestas y nos vemos al año que viene. Ohhh Carol, how beautiful they all are, how I like them, and how well they look on that splendid staircase. My favorite December and March. March already finished it in 1 x 1 soon I will show it. Very happy holidays and we do not see it next year. So lovely and inspirational. Thank you for posting them each year--I really look forward to seeing them. Merry Christmas to you and your family. Wow, Carol is a wonderful decoration! I wish you a happy Christmas with the family! Merry Christmas to you and your family! Your Parade of Ornaments is always such a delight. This year my two favorite are Joyeux Noel and Winter's Frost. Do you have a theme picked out for next year's ornaments? Ahhh, the tree! I love it. Just love your tree Carol. Gorgeous. My favorite this year is the sweet March. A Merry, Blessed Christmas to you all! Carol, you yearly ornament parade is one of the highlights of my Christmas season. You are so gifted in the finishing of these little treasures. My favorite this year is the October ornament. Perfection! I hope you have a very Merry Christmas, dear friend. I couldn't possibly choose a favourite - they are all gorgeous! I love to see your garland each year and your tree, it definitely feels like Christmas now! Hope you and yours have a wonderful Christmas Carol, and I look forward to seeing your stitching next year. Your tree and all of the Snowman theme ornaments you've stitched this year are just gorgeous! I couldn't pick a favorite, I loved all of them. So many beautiful ornaments! Your tree is stunning! I love the rich wall color. Defines the room! I can't choose a favorite for this year but I'm leaning toward August. Or January. Maybe December. Thanks for continuing to indulge us with this yearly show of stitchery. Your ornaments are to fabulous. I often say I need to stitch ornaments but I never have. I may follow your lead of one a month. That should be doable in between all the other things! Your tree is absolutely gorgeous. Have a merry Christmas and a safe and blessed holiday season. 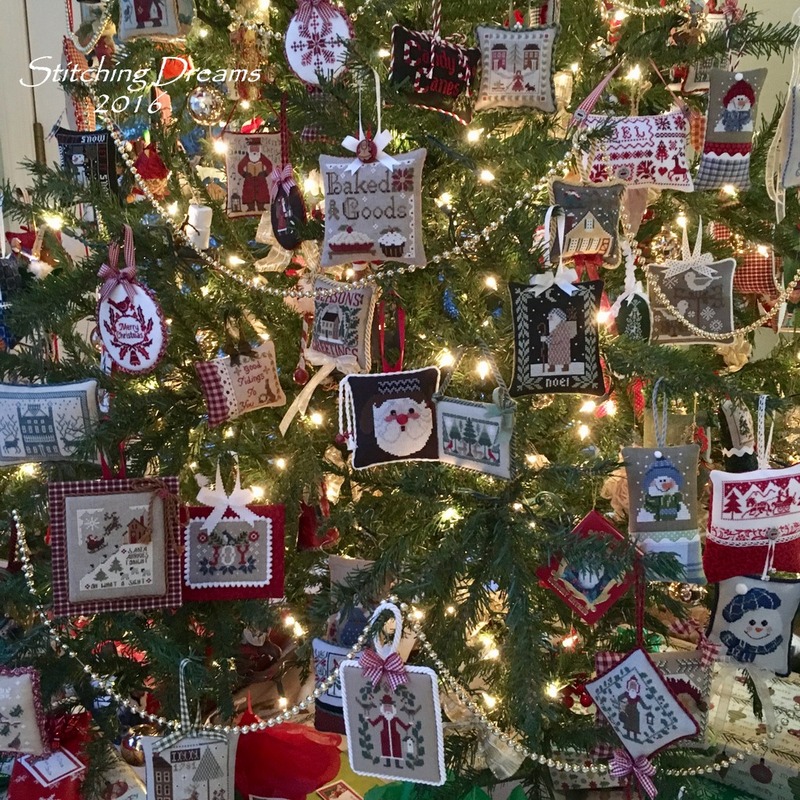 Oh Carol, my head is spinning from the sheer beauty of your tree with all of those amazing ornaments...your home looks like something out of a magazine. Thanks for sharing your home and hearth with us. Wonderful ornaments! My favorite this year is the one by Casa Mia, just love it! Love your tree, pinned it to my Board ha ha! Merry Christmas and Blessed Holidays! These all turned out wonderful! Your tree is simply gorgeous! My favorite is April "The Joys Of Christmas." I love the blue! Merry Christmas to you! Merry Christmas to you and your family, Carol! If only stitchers governed this world, what a wonderful world it would be! My favorite is the October piece on black and trimmed with red beads. Really, all your ornaments are favorites! Looking forward to your gifts received post! What a thrill this is! Your parade of ornaments has become part of the joy of Christmas! Your tree is spectacular and so very special. It just exudes love and joy. Without a doubt your sons will treasure these (when you downsize). It is always difficult to pick a favourite as each one makes me say 'oh, I just love that' but I think July is my all time favourite (but they are each amazing). Wishing you a wonderful Christmas and the very best of health and happiness in 2017. I had to laugh at your paint color comment because we've had the same three swatches on our wall for 2 years!! I decided I don't like any of them, but haven't gone back to select more to try...give me a quilt pattern and I can pick colors, but I am no good with a wall! Love all your snowmen but I agree with you - my favorites are the Country Cottage Needleworks ones too. I have big plans to get more of mine finished that I stitched this year...after I finish my last two Christmas presents! 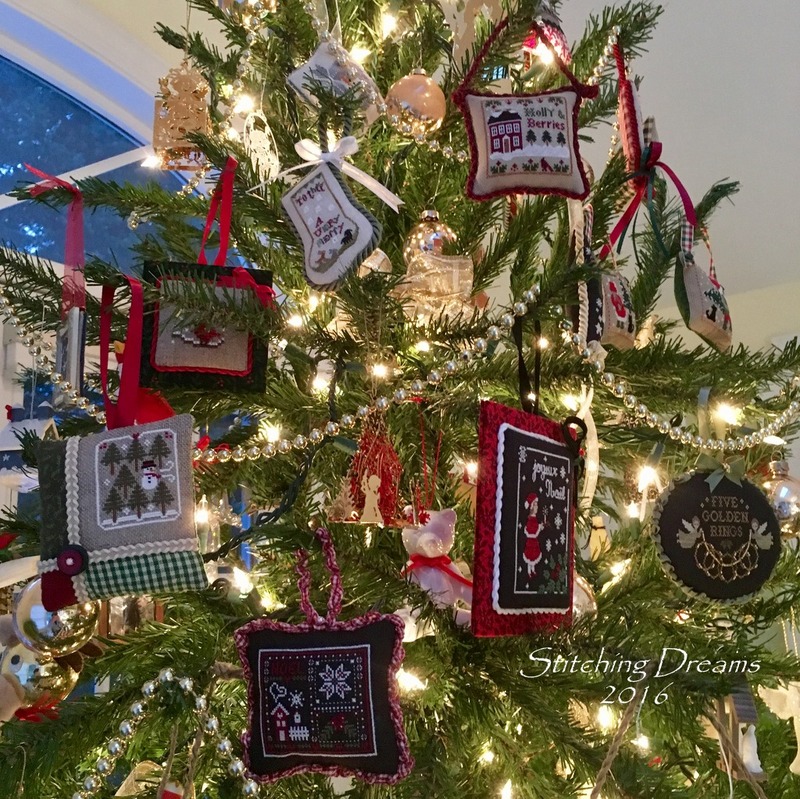 I have really enjoyed stitching ornaments this year - thanks for sharing yours and inspiring me - wish you and your family a very Merry Christmas! December is just lovely (all other are too, but thios one seems special, at least to me)! A very Merry Christmas to you and all your loved ones! all your snowman ornaments are wonderful. I have two favourites: March and June. Carol, I so enjoy receiving your blog posts! Your cross stitch projects always keep me motivated and inspired to continue mine. And such a beautifully accomplished blog! Thank you! Could you consider sometimes including tutorials of your finishing? And where do you find your trimmings? I check my local Joann's but not always successful in finding the right cording, etc. i love your Blog an all your wunderfull ornaments. You have to have THE most gorgeous tree I've ever seen. All of your ornaments are truly treasures, so glad your sons are interested in your work. They are all beautiful, it's hard to pick just one. But, I love the Drawn thread Joy ornament in blue. Thanks for sharing your 2016 Parade with us. Wat zien deze ornamentjes er prachtig uit, langs de armleuning! All your little snowmen look gorgeous so how could there be a favourite? It's the same every year, lol. But if I absolutely had to choose one it would be the January snowman with all the letters flying all around him like snowflakes. Thanks for showing them all again. They will inspire me next year when I will continue stitching Christmas ornaments for my grandson's advent calendar. A lovely Christmas post Carol.Your ornaments and your tree are beautiful.My favourite is still number 12,I loved him when you first revealed him to us,but they are all gorgeous. I love reading your blog.Thank you for the trouble you take each time to present it.It is lovley to read and visually always very pretty which is why I smile with anticipation each time I see a new post from you on my blog feed. It is always a pleasure to read your blog and see your delightful hand's work each year.Your tree is stunning as usual, your choices for this year are completely wonderful, your visions of choice making and taking home to live on a tree of your beloved sons is one that I have held in my heart since 1997 when I first became a Mom myself. Merry Christmas Carol and family! Always my favorite post of the year. :D OK, I can't help it - December is my favorite. It's so different and cute! Although I do have to say I love tiny. Over one is something I love but don't enjoy stitching myself. Anyway, your bannister looks lovely as always, as does your tree. Amazing! Is your tree artificial? Just wondering. I'm the only one in our family who wants an artificial tree. lol! Merry Christmas to you and yours! So pretty!! I am partial to April, June and October. :). Merry Christmas, Carol!! Beautiful tree and banister, Carol, as always. That tree must take a while to decorate but I imagine it is a labour of love. As far as the snowmen go, I am torn between January and February but think that my ultimate favourite is January. I love alphabets. Lovely Carol! I think April & September are my faves, I love the blue! Have you chosen a theme for 2017?!? It's all so amazing and gorgeous. You have the best cross stitch decorated house, ever! I'm sure you will have a very festive celebration. Merry Christmas, Carol, to you and your family! Love the snowmen on the stair railing!!! All the snowmen are wonderful. If I had to choose one it would be a very tough job. The ones I like the most, though, are March, May, June & August. What a wonderful decorating job you have done. Merry Christmas to you and yours, and Happy New Year! I think I like the jaunty stance of the February snowman. 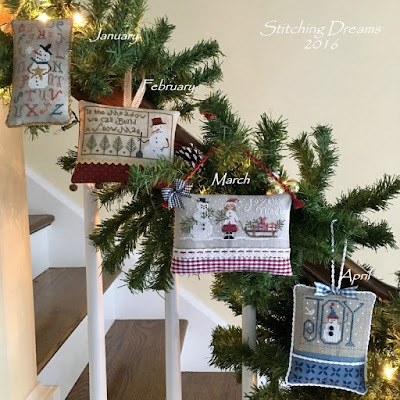 Such wonderful stitching and your tree is beautiful! Wow Carol , you did it again , what a wonderful display of the most beautiful ornaments. Well I love everyone of the snowmen this year but I really love the March one the best. Wonderful tree looks fantastic a real Winter wonderland . Have a very Merry Christmas sending lots of hugs and kisses to you all. Jennifer congrats with the LHN chart. The ornaments are all so beautiful, but my favorite is February. Oh, my, your new ornaments are so beautiful on your stairway!! I love them all. What fun it is to see your big, beautiful tree loaded with your beautiful "stitchy" treats. I know that if I was sitting in front of your tree that I would be speechless and mesmerized all at the same time. Thank you so much for sharing your talent with all of us year round and especially at Christmas. Merry Christmas and a Happy New Year to you and your family. I look forward to seeing more of your blog posts in 2017. Beautiful! 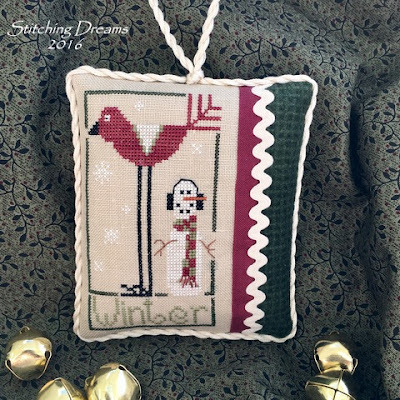 I love seeing all the christmas ornaments that you stitched throughout the year and this year, my eye keeps going back to the Dran Thread Joy Snowman and the CCN Snow on the light blue fabric. They are all wonderful! Carol: Merry Christmas: What a lovely tree, I too have a tree with all handmade ornaments, your snow people are adorable on the banister, I think my favorite is the All Through The Night Stockingful, they are all so sweet. Merry Christmas Carol and best wishes for a very Happy New Year! I love your Christmas tree with all of your handmade ornaments. I think my favourite this year is your ornament for March. I'm looking forward to seeing what ornaments you stitch next year! Such a beautiful ornaments, Carol! Love the Casa Mia frebbie, the design is really cute! Your Christmas decoration is also very beautiful!! Hi Carol. The ornament parade is never disappointing! And hard to pick a favorite. Each is finished beautifully also. What can be said about the tree..stunning! I have downsized from a big tree to a smaller tree already. I just have several even smaller (like 6 so far) to display my ornaments. I am hopeful my children will want some of my stitching. Wow, what a wonderful display! I think the January snowman is my favourite. I love every one of them - great finishing too! Tree is impressive! I love the way you hang ornaments on the garland and your tree looks beautiful! 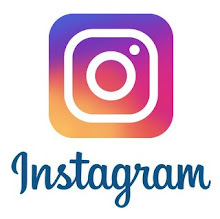 Thank you sharing for the pics as they are so inspiring! Have a wonderful holiday with your family! Oh my! Oh how I love looking at your blog and especially at Christmastime! ALL the treasures are great he taking.... You are truly an inspiration~. Here's hoping your Christmas is wonderful and 2017 brings you many blessings and much happiness~ Keep up the fantastic work! Such a lovely parade! I do have a favorite - the one stitched on black linen. It's SO striking and has inspired me to try stitching on darker fabric. I'm slowly working on a trio of Chalk Ornaments and have purchase some black fabric. And red!!! Your tree is amazing Carol! Love all your new snowmen ornaments.. finished so perfectly! They are just fabulous! Merry Christmas! I look forward to this post every year and see which ornaments will be coming down the stairs. It's my favorite post to read. Your tree is just stunning and one that I wouldn't want to every take down which is saying something because I take my tree down literally right after Christmas. I see so many ornaments on your tree that are in my stash to stitch. The ones stitched on black have crabbed my eye this year as they just seem to pop. As for your parade of ornaments, it's hard to say which is a favorite. They all catch my attention in one way or another. I do like the Snowmen Trio stitched in black. I have stitched it on a light background, but think I'll stitch another one on black this year. Merry Christmas! I have been busy with our out of town son here so this is the first time I've seen this post. I love all of your ornaments but June is probably my favorite! Your tree looks so pretty! Merry Christmas and have a stitchy new year! Because I'm slow that way, I just figured out that all the ornaments featured snowmen! I am most enamored with April and October - in part because blues of all shades 'call' to me. All 12 are lovely. Your tree is so beautiful, Carol. I love that you do a Parade of Ornaments each year. My favorite is the snowmen row by CCN. Hope you had a great Christmas! Wow, I could sit here and look at this post all day! : ) For a snowman lover - pure bliss! Casa Mia's Joyeux Noel really caught my eye - so sweet. Hope your Christmas was a merry one, Carol! Oh I love all of your beautiful ornaments!! I can't pick a favorite because they are snowmen and I just LOVE them all!! Beautiful work on each one. I just love your tree. How perfect. Thanks for sharing. 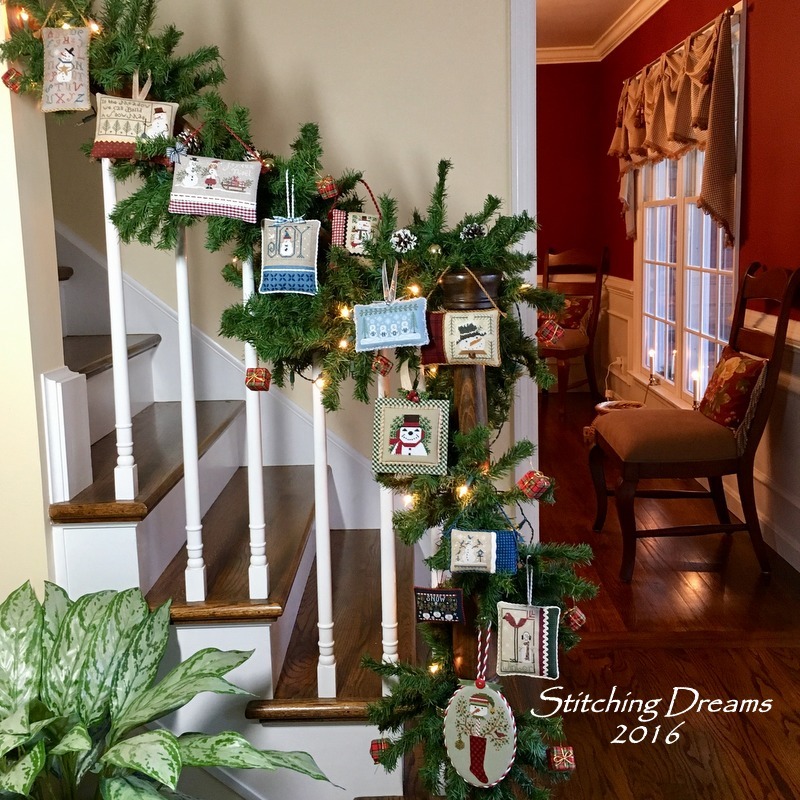 Your tree looks stunning with all the wonderful stitched delights adorning it. I hope you were able to enjoy a wonderful Christmastime with the family and I wish you a happy and healthy 2017. Your tree is spectacular, as usual, Carol. I love all of your snowmen. I think that September and October are tied for my favorites. Happy new year to you and your family. June, September, October and December are my favorites. I love all of them, of course, but I am partial to these. They are all beautiful and I like the way you choose a theme each year. I'm terribly envious of your stick-to-it-iveness in creating one a month each year. Have a truly blessed New Year! Oh My! what a gorgeous tree Carol. It's always a joy to look at all the fabulous ornaments beautifully displayed in you home. I hope you had a fantastic Christmas and may the New Year brings you much more joy and a great year ahead. I hope you had a wonderful Christmas, Carol! Your snowmen ornaments are fabulous. 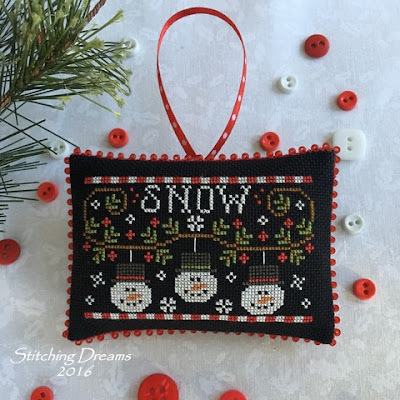 If I had to choose favourites I would say 'Parson Brown' and the trio of snowmen stitched on black - I love the red beaded edging that you've used. Have you chosen a theme for this year? Each year I look forward to seeing your tree and all the lovely ornaments you stitched. If I have to choose, I would pick July but all of them are delightful. Will you have a theme this year ? I hope your Christmas was wonderful, I am just catching up between being gone and then both of us with a yucky virus. Catching up on blog reading here. Thank you for showing us your Xmas decorations and tree. My favorites are January and May. Your family must be so proud of you to put in so much love and effort to make these ornaments. I'm always late in posting, but I wanted to be sure and say how lovely all your ornaments are for 2016! The snowmen are so very sweet! What a good idea to pick that as your theme! I have very few snowmen ornaments, and I think that might be a good plan for me one day! Yours are lovely! December days and a giveaway!